For those with the right temperament to be a landlord, the buy and hold strategy can be an excellent way to achieve the goal of generating cash and building long-term wealth. In the recession, the value of retirement accounts dropped significantly, some by 50 percent or more. But in that same time-period, rents did not drop at the same alarming rates, nor did the value of rental properties bought at a sane market value. There are some risks to the buy-and-hold strategy. The costs and hassles of dealing with problem tenants can quickly eat up the income from the property, and even cut into the value of the property itself. Given the long-term nature of the investment, be careful to choose locations that don’t have underlying economic risks. If local employment is tied to just one industry, for example, you may put yourself at significant risk should that industry decline or move operations. One of the primary decisions when pursuing the buy and hold strategy is whether or not to use leverage. By financing your purchases you can spread your investment capital across more properties, diversifying risk and increasing overall returns in an appreciating market. Purchasing properties with all cash, on the other hand, decreases losses in a declining market and increases returns in a flat market, as no income is lost to interest expenses. For example, imagine you have $100,000 to invest. 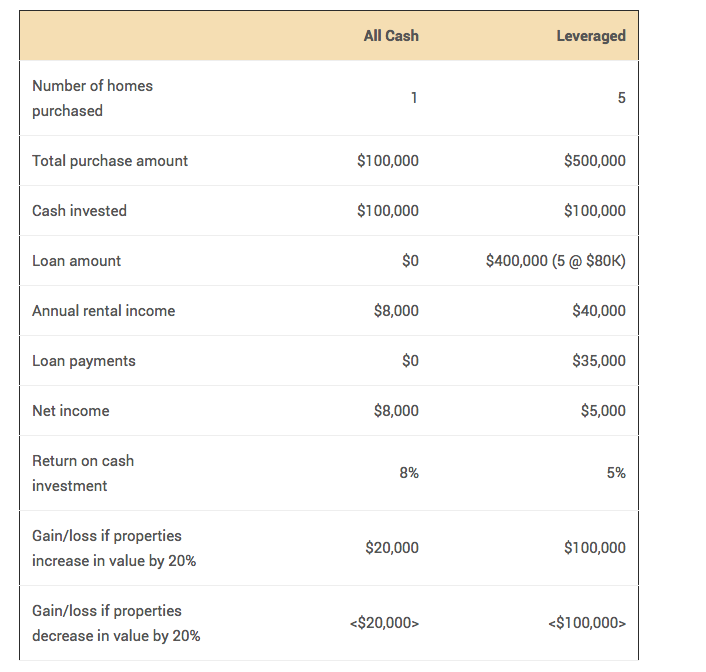 Using leverage you could buy five $100,0000 houses with $20,000 down on each vs. one house using all cash. Note that in our hypothetical example above, using leverage has huge advantages in a rising market (returns on appreciation), has slightly lower returns in a flat market (return on cash from rents alone), but can be disastrous in a declining market (leverage amplifies losses). The buy and hold strategy offers tax advantages and inflation protection. Holding a property for at least a year and a day before you sell places the profit in the category of a long-term capital gain. Selling it within a year of purchases classifies the profit as a short-term capital gain. Under the tax law as of this writing, short-term capital gains are taxed at your ordinary income tax rate, which could be as high as 35 percent. By contrast, the long-term capital gain tax rate is zero if your total income, including capital gain income, places you in the 10 or 15 percent tax brackets. It is 15 percent if your total income (including capital gain income) places you in the twenty-five percent tax bracket or higher. As inflation increases, so should rents, which means while you hold and rent, the income you receive should adjust over time to match inflation. In a normal market, free from government intervention into the availability of credit, home values increase at a rate roughly equivalent to the rate of inflation. When you decide to flip the house, say at the top of an inflation cycle, your return on investment has a built-in inflation hedge not necessarily found in other investments. When buying or renovating a property for rental, keep a few things in mind. Location. Consider areas with a consistent tenant pool such as neighborhoods near colleges and universities. Factors such as schools, proximity to public transportation, amenities, entertainment and community feel are also critical for long term investment value. Durability and low maintenance. When it comes to appliances, carpet, paint, siding, and other features, price is less important than lifespan and time to maintain . Consider simple, drought-tolerant landscaping. Purchase stain resistant low-pile carpets, quality ceramic tile flooring, or quality laminates and satin or eggshell neutral paints when rehabilitating a rental property. The initial cost of quality products will withstand the abuse of renters, last through more tenant turnovers, and cost less in the long run. Neutral colors. Don’t renovate based on your personal taste or some edgy style you saw on a home makeover show on TV. Using bold, vibrant colors may make the space pop, but it will clash with the furniture or preferences of others, reducing your pool of potential tenants and delaying time to revenue. Tenants are more likely to tolerate neutral colors without the desire to repaint than they would if using Tropical Holiday, Bliss Blue and Cool Melon. No swimming pools. Don’t buy a house with a built-in maintenance issue and personal injury liability. One mishap with a swimming pool could sink any investor.